Whilst a kart driver may be adept at making quick laps, may train rigorously and maintain impressive levels of personal fitness, a poor race start can spell disaster for a race outcome from the word go. So how do winning drivers achieve successful starts? Karting experts highlight confidence and self assurance as vital when it comes to setting off at speed. Many drivers report experiencing sensory overload at the start of a race. Anticipation, adrenaline, race strategy and technical factors all jostle for space in the driver’s mind. It can be difficult to overcome this feeling of overload. Whilst the principles of ‘practice makes perfect’ can be applied to a variety of karting techniques, such as driving in wet weather, the number of authentic race starts experienced by an individual driver is obviously limited. So how can the sensory overload often experienced at the start of a race be tackled? For many, visualisation is the key to a successful race start. To make the most of visualisation techniques, try to find a relatively quiet place where you can relax both physically and mentally. Make a note of the position in which you are starting and who is preceding and following you. Think carefully about precisely how you want your start to go. Visualise yourself speeding across the line. Imagine yourself overtaking the driver in front of you and making the most of the first corner, or whatever the details of your race start strategy may be. In order for your plan to take shape and be of benefit to you in the race, it is important to visualise each ideal detail of your start. This will help you to make your projections a reality when seated in your kart. Be sure to imagine the rest of your first lap, too. Visualising the perfect lap in which you fly at breathtaking speed and overtake karts with ease will consolidate your race plan and invest you with pure confidence. When sitting in your kart, play over your plan in your mind. Tell yourself that you are the most confident and prepared driver in the race. Concentrate on this advantage. Use the rolling lap as a chance to focus upon your plan and how you will put it into action. Stay as close as possible to the kart in front of you. 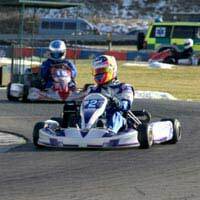 When it comes to the actual start, experts highlight being sure to go first as the most important practical move to make: it is vital to accelerate before the kart in front of you. Experts advise that you try to touch the bumper of that kart, with no space between the two karts. This will minimise the risk of a crash whilst giving you the advantage you need to make a successful race start. Once your kart has crossed the line, your plan kicks in. Aim to make the ideal lap you visualised become a reality. Visualisation, self confidence and mental preparation might seem far removed from the high speed world of karting but many experts stress their importance when it comes to making a great race start. Practice visualisation techniques so that they become second nature on race day.